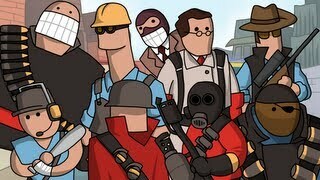 The Team Fortress game in a nutshell done with some funny animation and commentary. It goes through both games and the story of red versus blue, in an animation type of way. LORE – Team Fortress 2 Lore in a Minute! We begin in 1850 when a wealthy Englishman, Zepheniah Mann, owner of Mann & Sons Co., is convinced by his idiot twin sons – Redmond and Blutarch – to purchase land in the United States to expand their company. Zepheniah Mann discovers that the gravel pits and dustbowls he purchased were useless and on top of that, he contracted various illnesses traveling to the United States. With his last will, which he wrote on his skin, he left his sons equal halves of his land, ensuring that they would fight over it for the rest of their lives. To capture his brother’s half, Blutarch hired 9 mercenaries but unbeknownst to him, Redmond had ALSO contracted exactly 9 mercenaries to do exactly the same thing. And for the next 40 years, they would engage in an endless war because neither brother was bright enough to, perhaps, hire more mercenaries. Blutarch, nearing death from old age, contracts expert craftsman Radigan Conagher to build a machine that would extend his life. However, Radigan was also convinced to build the same machine for Redmond by a stranger offering Australium, a rare and powerful element only found in Australia that turned a nation of savages into hyper-intelligent beings. Fast forwarding to 1968, Builders League United and Reliable Excavation & Demolition, once again, recruit 9 mercenaries, the Scout, Soldier, Pyro, Demoman, Heavy Weapons Guy, Engineer, Medic, Sniper, and Spy to continue the war for the land left behind by Zepheniah Mann. Helen, known as The Administrator, oversees the conflict between RED and BLU with the help of Saxton Hale who provides weapons and headgear to each side. Just remember, EVERYONE is a Spy.